Social media has been inching its way into other forms of advertising, including commercials. 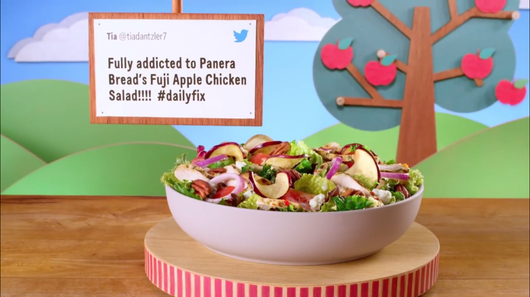 At first, it was "innovative" when companies would include their Facebook URL or Twitter handle on their commercials, but Panera took it to a new level. Did you catch it? They used actual tweets from customers to promote their products. Start with your fan base: use a content for a double win - encourage customers to tweet about your product with a specific hashtag on your social media sites. Select a random post every day as a winner. Not only can they win something such as a gift card to your business, but the opportunity to be highlighted in your upcoming marketing piece. Thank & reward those who are currently doing this: you may not need a contest - you may find that your customers are already talking about your brand, even maybe using hashtags. By reviewing the data from your social media monitoring program, you can identify these consumers, connect with them, and ask permission to use their content in your upcoming marketing promotion. This is a great way to engage and reward your customers! Using social media conversations as marketing tools is yet another great reason for monitoring social media data surrounding your brand and products. Use the unstructured feedback as a tool while building relationships and engaging your fans. For the 5 Most Fascinating Stories, in Franchising a weekly report, click here & sign up.